Here are just some of the ways you can help Sullivan’s Heroes to support families fundraising to adapt their home for a disabled child. AmazonSmile is a simple and automatic way for you to support Sullivan’s Heroes every time you shop, at no cost to you. Find out more about AmazonSmile here or shop at AmazonSmile here. 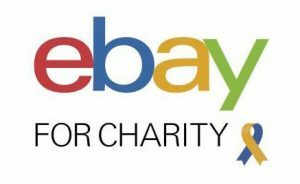 Sell your items on Ebay for Charity for Sullivan’s Heroes, and you’ll raise funds for disabled children’s home adaptations while you sell! You can donate anything from 10% up to 100% of your sale. Plus, you’ll receive a fee credit on your basic insertion and final value fees equal to the percentage you donate. So, if you donate 50% of your selling price to Sullivan’s Heroes, eBay will waive 50% of your fees. Find out more and start your eBay for Charity selling here. Sullivan’s Heroes relies on donations from individuals and businesses alike to ensure ongoing grants can be met for disabled children. See all Our Heroes who have helped us so far. To discuss making a corporate donation to Sullivan’s Heroes please contact us. If your company runs a ‘Charity of the Year’ or other charity support scheme, please consider putting Sullivan’s Heroes forward. All funds raised will help enormously to support disabled children. Take a look at all Our Heroes who have helped us so far. Match Funding – perhaps you are taking part in a sponsored event for us? Many companies will offer Match Funding, which is a great way to add to the amount you have raised – ask your company for information about this. To discuss how Sullivan’s Heroes can meet your company’s Corporate Social Responsibility strategy please contact us. If you would like to support Sullivan’s Heroes on a regular basis, then Payroll Giving may be ideal for you. Your donation is taken direct from your salary before tax is deducted. This is a very tax effective method of donating as we receive your donation and the tax you would have paid on this amount is added on by the government. Companies often operate Payroll Giving as part of their Corporate Social Responsibility, they may also offer to match your donation – please ask your company for further information, or visit the HMRC website to find out how to introduce Payroll Giving and Match Funding at your place of work. If you would like to donate to Sullivan’s Heroes in lieu of sending gifts for a birthday, Christmas or special occasion, Give Cards by JustGiving allow you to donate your funds and send a greeting card to your friends and family. Select your card and donate at the following links for Birthdays and Special Occasions, or for Christmas. Or perhaps you’d like to forego gifts yourself and ask your friends and family to donate their cash to Sullivan’s Heroes instead? Set up your fundraising page to share with them at JustGiving. All monies donated will be used towards home adaptations grants for disabled children, and will greatly improve their home life. Looking to raise funds for Sullivan’s Heroes on your birthday or for an event? It’s simple to set up a Facebook Fundraiser and share with your supporters – find out how here. If you would like remember a loved one and raise money in their name towards Sullivan’s Heroes, it is very simple to set up an ‘In Memory’ fundraising page with JustGiving. All monies donated will provide a long lasting legacy towards helping out a disabled child, and greatly improving their home life. Another way to make a lasting difference is to leave a legacy in your will. All you need to do is include Sullivan’s Heroes in your will – Registered Charity number 1163021. If you would like friends and family to support us in your memory, why not ask someone to ensure that any donations made come to Sullivan’s Heroes. It will provide a long lasting legacy to greatly help out local families in need. Please help us by spreading the word about our charity, our website and our Facebook page. By registering a contact email address on our Newsletter Sign-up we can also keep you and all those registered up to date with our latest news. Plus, use our form in the footer of this website to Tell a friend about our charity. Like, Follow and Share our Facebook page with all your friends, family and colleagues who may like to support us. Please Contact Us if you have any fundraising ideas you’d like to share with us. Or if there’s a sponsored event or challenge you’d like to undertake, but you don’t see Sullivan’s Heroes listed with the event or activity organiser – please let us know and we’ll sign up with them!